UNCRO was deployed in Croatia, UNPROFOR was deployed in Bosnia and Herzegovina, and UNPREDEP was deployed in the Former Yugoslav Republic of Macedonia. UNPF’s headquarters in Zagreb, Croatia, served as the theatre headquarters of UNCRO, UNPROFOR and UNPREDEP. Each of the three missions was headed by a civilian Chief of Mission and had its own military commander. UNPF was headed by two Special Representatives of the Secretary-General (SRSG). Yasushi Akashi of Japan served as SRSG from 31 March to October 1995. Kofi Annan served as SRSG of UNPF from November 1995 to April 1996 before returning to his post as Under Secretary-General at United Nations headquarters in New York. 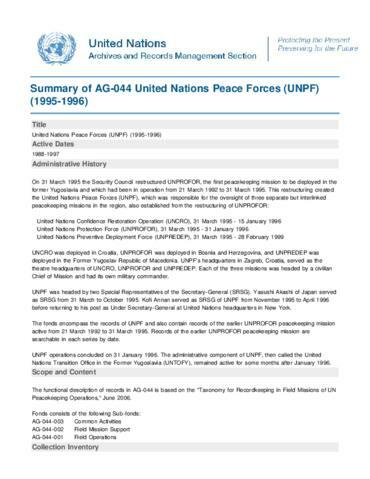 The fonds encompass the records of UNPF and also contain records of the earlier UNPROFOR peacekeeping mission active from 21 March 1992 to 31 March 1995. Records of the earlier UNPROFOR peacekeeping mission are searchable in each series by date. UNPF operations concluded on 31 January 1996. The administrative component of UNPF, then called the United Nations Transition Office in the Former Yugoslavia (UNTOFY), remained active for some months after January 1996. The functional description of records in AG-044 is based on the "Taxonomy for Recordkeeping in Field Missions of UN Peacekeeping Operations," June 2006.